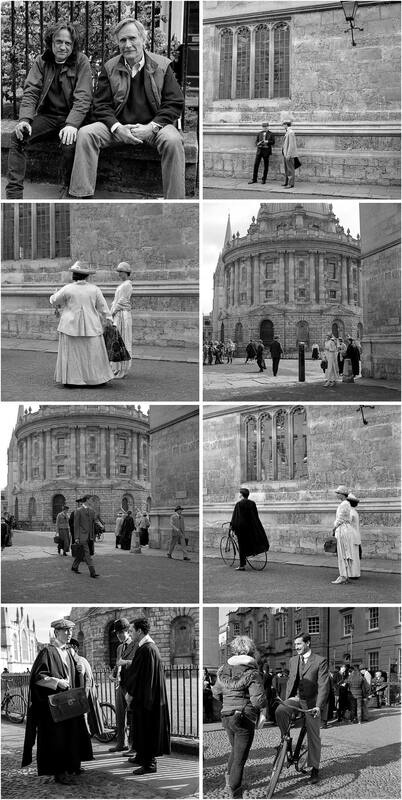 Behind the scenes photography during filming of the movie Testament of Youth that took place in Radcliffe Square, Oxford on 9th April 2014. In the first shot the Director of Photography for the movie is on the left. The movie is based on the memoirs of Vera Brittain and the lead role is played by Alicia Vikander who can be seen in a few of the shots below. Security was quite tight so there wasn’t a lot of opportunity to vary my position for photography and my Rolleiflex TLR has a fixed 80mm lens so that was another limiting factor but I’m pleased with how these shots turned out, all from the same roll of 12 frames. [Tech info:] Rolleiflex 2.8F, 80/2.8 Zeiss Planar, loaded with Kodak Tri-X 400 (expired), processed in Kodak HC110 1+31. 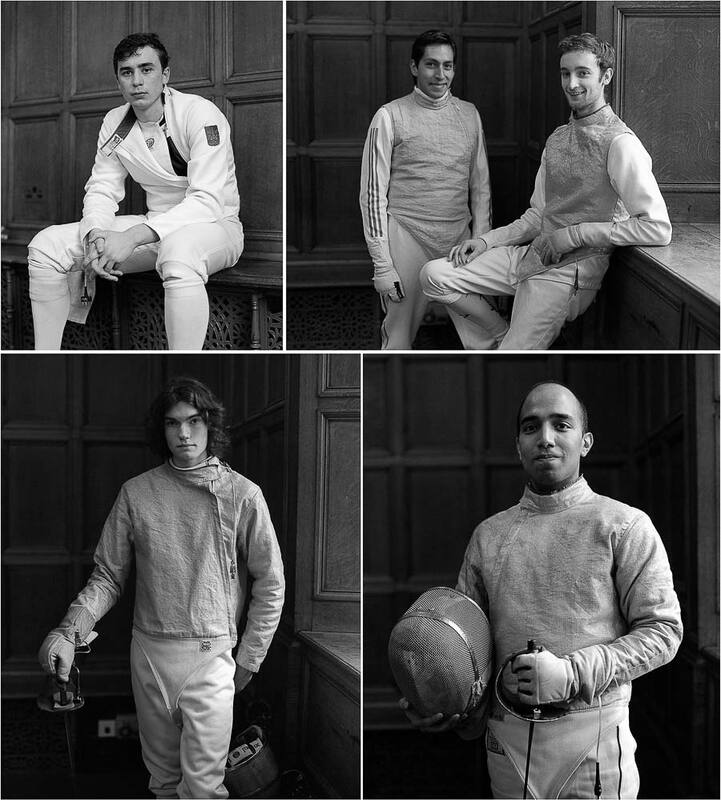 Last weekend was packed with sporting events for the Oxford vs Cambridge Varsity 2014 competition and on Saturday morning I attended the Fencing which was held at the Examination Schools on the High Street. It was a grand venue for a sporting event and I really enjoyed seeing some of the action. Although I went prepared with a small lighting kit I decided to make use of the daylight coming in through the windows. These portraits were all made during the competition which is why there aren’t very many. This is the contents of an entire roll of film, all 10 frames. I did also photograph some of the action but those shots will follow at a later time. [Tech info:] Mamiya RZ67, 110/2.8 lens, loaded with Kodak Tri-X 400 (expired), processed in Kodak HC110 (dilution b). 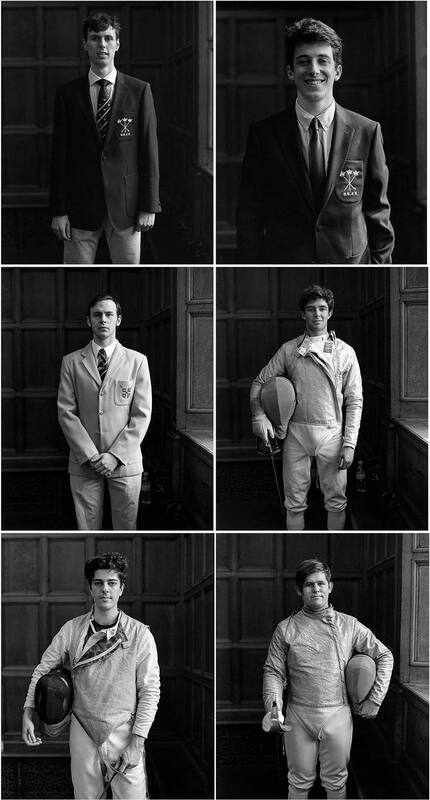 The Oxford vs Cambridge Varsity competition takes place in Oxford every two years (the venue alternates between the two cities every year). In 2012 I photographed some powerlifting but I found out a bit late and most of the other events had already taken place so this year I’ve been doing some research to try to photograph as many events as possible. 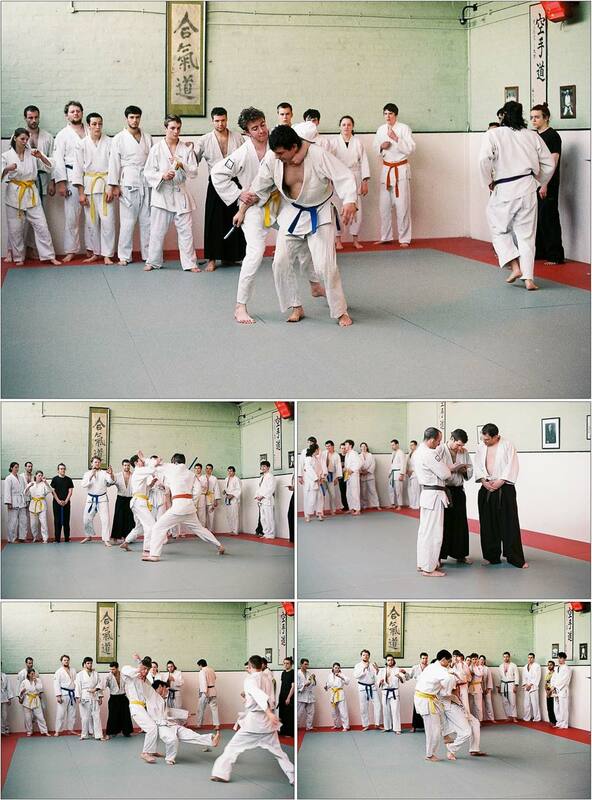 Oxford won the Jitsu competition this year which took place in the dojo at the Iffley Road sports centre. I went along to photograph some of the training the day before the competition and then the next day which was the competition proper. 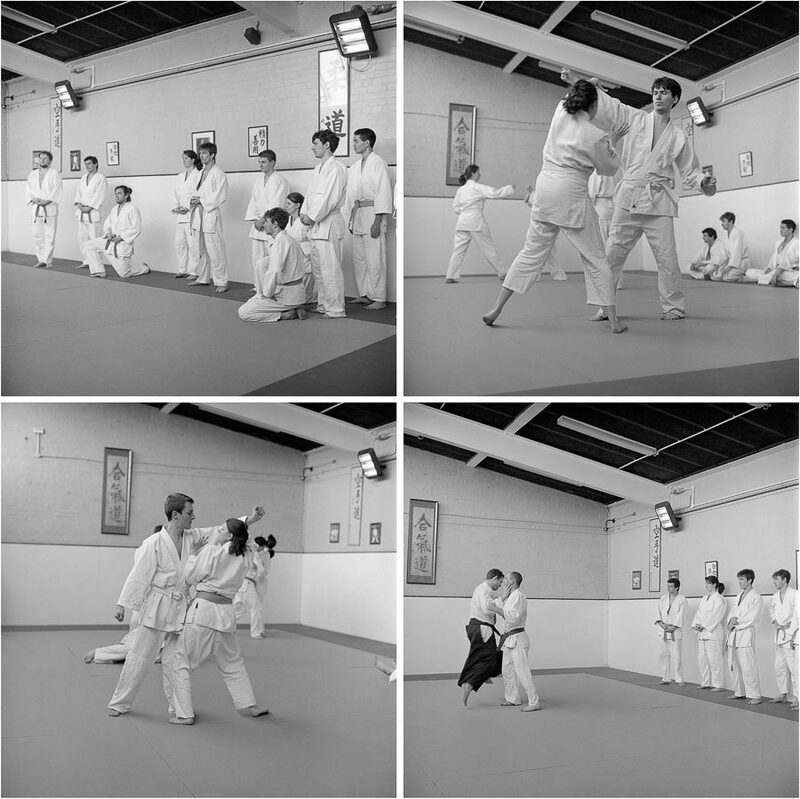 The b&w shots below are from the training session and the colour shots are from the competition. The action was fast paced so I didn’t mange to shoot many frames but of the handful that I did shoot these are the ones I like best. [Tech info:] B&w shots – Rolleiflex 2.8f, 80mm Zeiss Planar lens, Kodak Tri-X 400 (expired), processed in Kodak XTOL 1+1. Colour shots: Nikon FM2, 50/1.4D, Agfa Vista 200 film, dev & scan at ASDA in Swindon. Many thanks to Simon for such great service. These shots were all made during the filming of the fourth and final episode of series 2 of Endeavour. This episode has the least amount of scenes that were shot in Oxford but I’m still excited to see it. Most of the scenes on this particular day were inside a house in North Oxford and even though I didn’t manage to do much photography I enjoyed chatting with the neighbours who came out to see what was going on. [Tech info]: Rolleiflex 2.8F, 80mm Zeiss Planar lens, Kodak Tri-X 400 (expired), processed in Kodak XTOL 1+1. Recently I’ve been using my Rolleiflex 2.8f quite a lot and I’m really enjoying it. 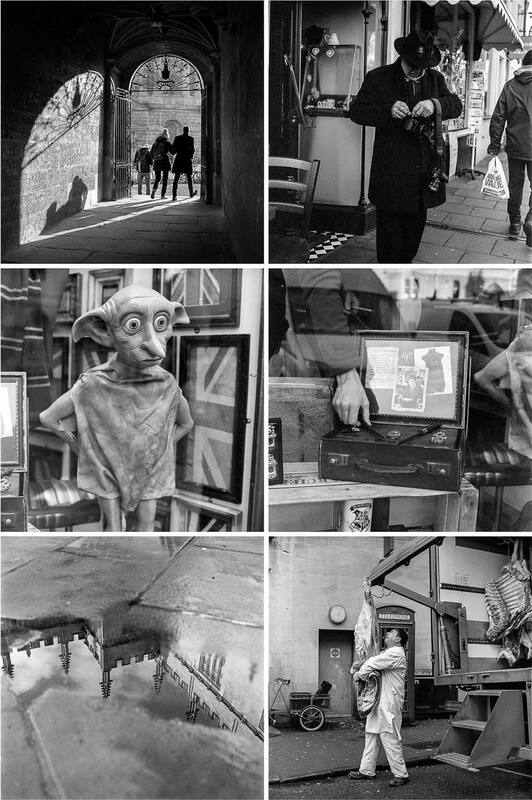 These images are all from the same roll of film, shot during my lunch time photo walk around Oxford city centre. [Tech info:] Rolleiflex 2.8f, 80mm Zeiss planar lens, loaded with Kodak Tri-X 400 (expired), processed in Kodak HC110 1+31. 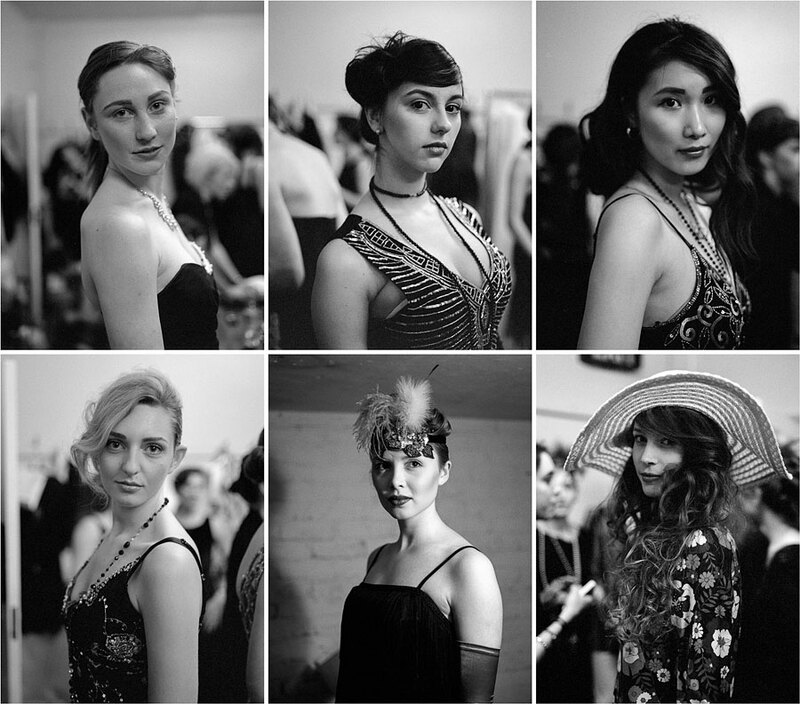 Last Saturday I did some backstage photography during TEDx Oxford 2014 which was held at the New Theatre on George Street. I have fond memories of going to the New Theatre as a child and once even saw a double bill screening of The Spy Loved Me and Revenge of the Pink Panther there. A large white safety screen was hung over the stage and the movies were projected onto that. So, I was excited to be backstage and get a glimpse behind the curtain. I did do some photography of the speakers from the wings but for me I most important thing was to photograph the worker bees that were making the event happen because without them there wouldn’t be much of a conference. These shots are all from the same roll of medium format film, made in available light. [Tech info:] Rolleiflex 2.8f, 80mm Zeiss Planar lens, loaded with Kodak Tri-X 400 (expired), rated at ISO 800, processed in Kodak HC110 1+31 for 9 mins. The Endeavour crew were here in Oxford last weekend to film parts of series II episode IV which will be the final episode of the second series. They were only here for two days which is a lot less than the previous three episodes. The weather was cold and very wet at times which limited the amount of photography I was able to do. 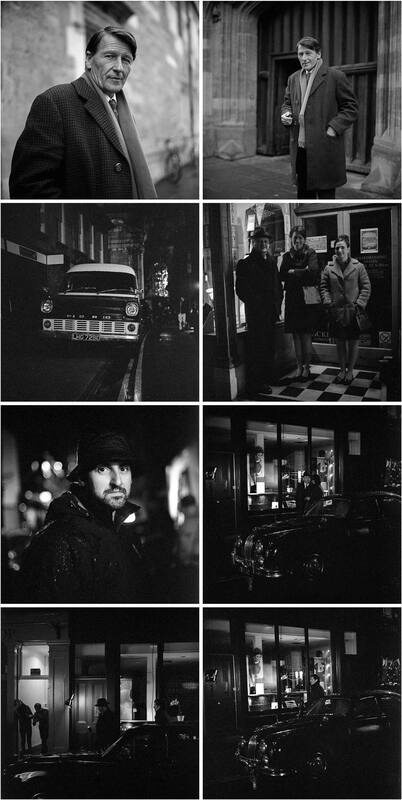 Here are some shots from a night scene that was filmed on Turl Street. [Tech info:] Rolleiflex 2.8f, 80mm Zeiss planar lens, loaded with Kodak Tri-X 400 (expired), processed in Kodak HC110 1+31 for 9 mins. 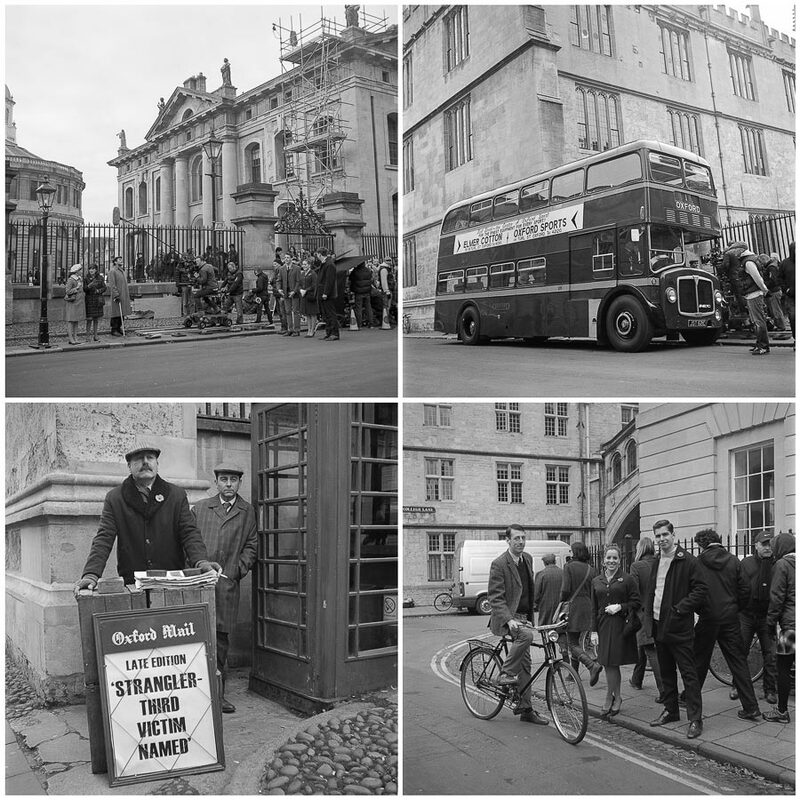 Here are some more shots from day two of the recent Endeavour filming in Oxford. This episode looks like it will be very exciting. It’s hard to make out in the bus picture but Colin Dexter is making a cameo appearance, he’s sitting next to the window on the lower level, first window from the right. [Tech info:] Rolleiflex Automat 3.5 loaded with Kodak Tri-X 400, processed in Kodak HC110 (1+31) for 7:30. There’s something that just feels right about photographing behind-the-scenes pictures of a tv show set in the 1960’s with a camera that is from the 1960’s. 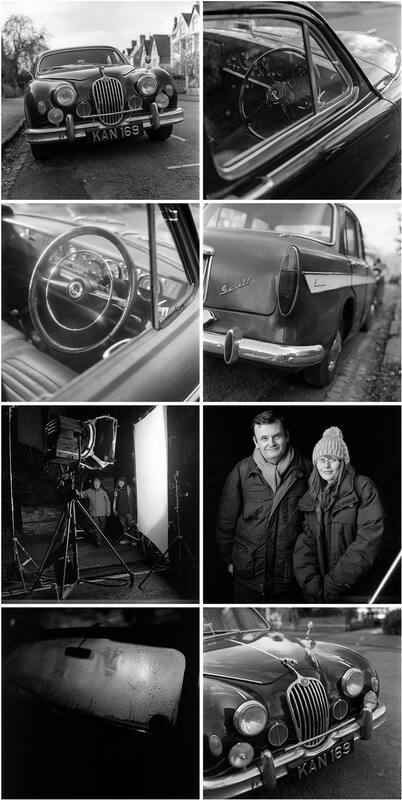 These shots are the entire contents of my first roll of film last Sunday morning when the Endeavour film crew were in town shooting the second episode of four new ones that will be broadcast next spring. 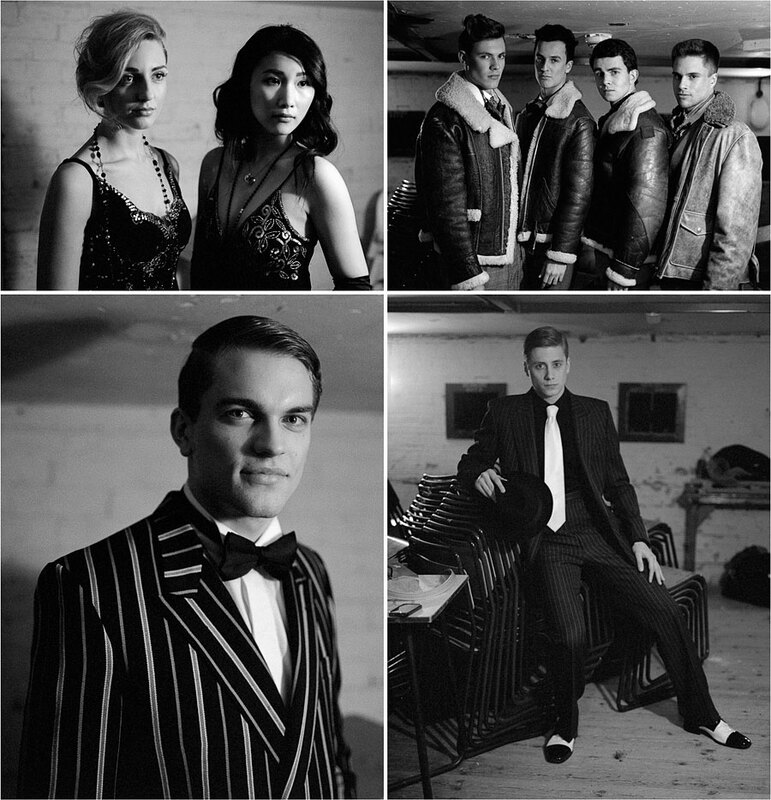 The episode title of this one is Nocturne so keep an eye out for some of these smartly dressed supporting actors. Just as I was getting going with my photography rain stopped play and I had to head for shelter in the Covered Market. The photographer is not part of the filming but he just happens to be one of my favourite Oxford street photographers and we bumped into each other completely by chance and had a nice chat while it poured down with rain. Shortly after that the film crew relocated to Exeter College gardens where they managed to film a little more before the sky opened up again and they stopped for lunch. I did manage to shoot another half a roll, those shots to follow soon. [Tech info:] Rolleiflex 2.8F Zeiss Planar loaded with Kodak Tri-X 400, processed in HC110 dilution b for 7:30.